Ensure you have top of the line barcode & machine vision software. 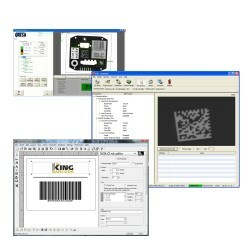 King Barcode offers the highest quality, top performing, and most efficient manufacturing software for your business needs. iNspect is a vision application software specifically designed to simplify the design and deployment.. User Documentation, Software and Drivers for MicroScan Fixed Scanners. (Ships with all MicroScan Sca..
Sherlock is an advanced machine vision software interface that can be applied to a wide variety of a..